This extension is intended to help modders creating mods for Paradox Interactive games by providing basic yet necessary conveniences. 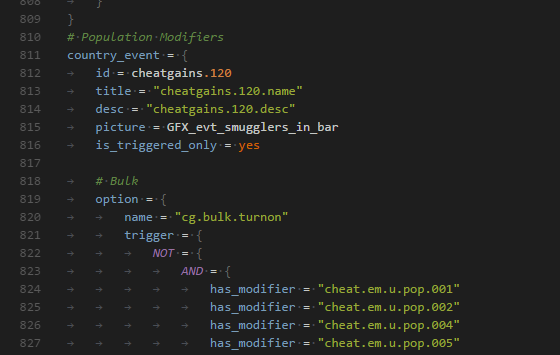 Syntax support is provided for .txt and .mod files. However due to the fact that VS Code by default sets the .txt files to Plain Text syntax you will have to set the association manually. To do that, after you have opened the .txt file, you have to click in the bottom right of the window where it says Plain Text. In the newly opened popup type in 'Paradox' and select the Paradox (paradox). Alternatively, you can open the Command Palette (by default [Ctrl]+[Shift]+[P], or in the menu click View > Command Palette...) and type in the newly opened popup Change Languague Mode. Press [Enter] then type in 'Paradox' and select the Paradox (paradox). Extension comes with it's own colour theme but it's not enabled by default. If you wish to activate it go into the Command Palette (by default [Ctrl]+[Shift]+[P], or in the menu click View > Command Palette...), type in 'Color Theme' and press [Enter]. Type in 'Paradox Theme' and press [Enter] again. Extension comes with a few snippets. Currently available are the ones helping with event creation as this is mostly the main thing that a modder might need and at the same time is somewhat universal between different games.